This question comes to me from a long-time blog reader who strongly believes that e-commerce and mobile are the same thing. Question: Kevin, you believe that mobile and e-commerce are separate. They are not separate. They are the same thing. Mobile is just the next evolution in computing, from desktop to laptop to mobile. Nothing changes. And I don't understand why you feel differently. Why do you think mobile is going to disrupt e-commerce? I want to show how e-commerce displaced cataloging, and then I will show you the difference in a mobile-centric business displacing e-commerce. 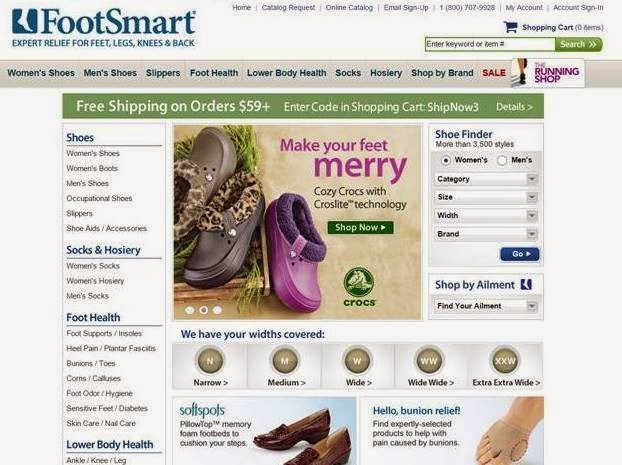 Let's look at the home page of a classic cataloger ... FootSmart. 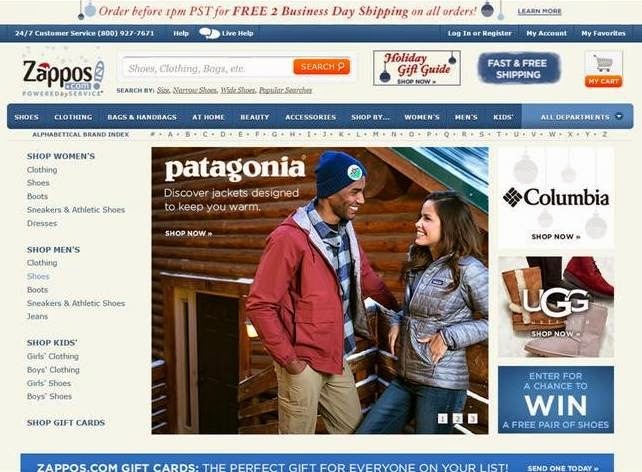 Now let's compare the home page to Zappos, a classic e-commerce brand. The differences are subtle. Catalogers are far more text-oriented than are e-commerce businesses, and for good reason - catalogers have a strong text-centric selling history. From a lifestyle standpoint, FootSmart caters to the core catalog customer ... dedicating home page real estate on Foot Health. The cataloger cannot help but be text-centric, it's in the DNA of the business model. The cataloger cannot help but offer "Foot Health", because the DNA of the customer is much older, given the appeal of the catalog marketing medium to Baby Boomers. These differences in creative strategy result in Zappos having a dominant online business, and result in FootSmart having a dominant catalog business. Both are successful. But the approaches are different, and the customers are different. E-commerce splits away from cataloging, even though catalogers utilize e-commerce. The two business models are fundamentally different. Now to e-commerce vs. mobile. 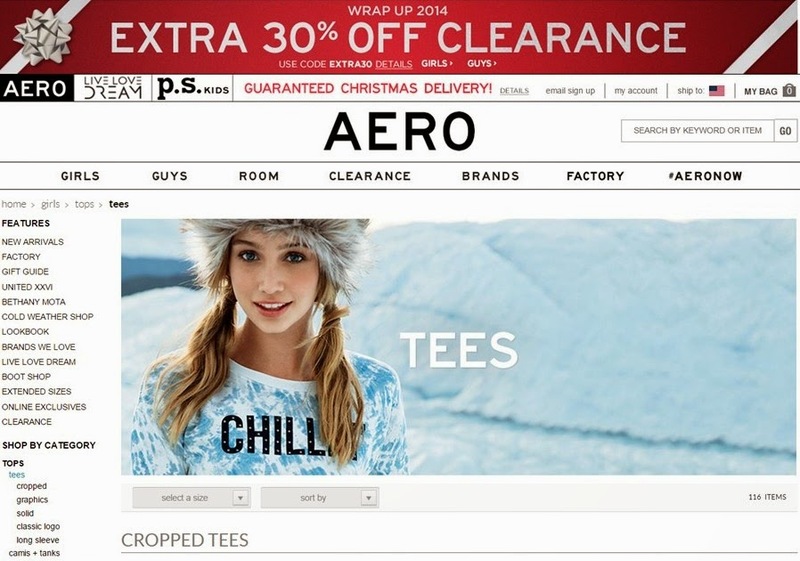 Let's look at the landing pages for t-shirts at Aeropostale and Brandy Melville. 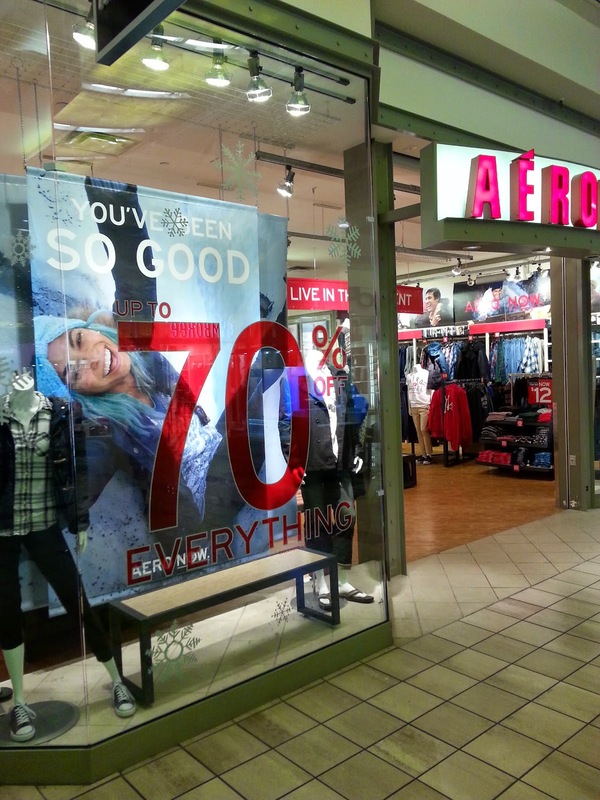 First, Aeropostale, utilizing classic e-commerce. Now look at Brandy Melville, looking at Graphic T's. Do you see a difference? The Aeropostale presentation is classic e-commerce ... it looks a lot like Zappos. Links and a story and a sale message. The Brandy Melville experience is borrowed from mobile, isn't it? Yes, it's e-commerce we're looking at, but this is mobile inspired, it's social inspired (Instagram). To be fair to Aeropostale, when you drill down to graphic t's, you get a similar presentation style. But you have to travel a significant difference at Aeropostale to get to the same place Brandy Melville takes you to, right off the bat. This presentation style is not natural to Aeropostale. Do you understand the migration from FootSmart to Zappos / Aeropostale to Brandy Melville? FootSmart is aligned with the catalog heritage and Baby Boomer (Judy) preference. Zappos / Aeropostale is aligned with their e-commerce success ... the past decade shapes and forms their experience, and as a result, attracts a certain customer. Brandy Melville is aligned with a social/mobile (younger) shopper who has expectations. Brandy Melville is going to better meet these expectations than will other businesses. These expectations are driven by mobile/social/lifestyle. In this way, then, mobile will carve out the bottom of the e-commerce customer file. Customers will align around demographic preferences, and as a result, will prefer certain presentation styles. All four of the companies illustrated here sell via e-commerce. But their styles, and customers, are very, very different. The FootSmart customer is not going to buy from Brandy Melville, and vice versa. In this way, mobile is going to slowly wipe out e-commerce. Question: How will omnichannel be bad for a retail market? We are creating new markets (e-commerce, mobile, social), and that will yield more customers. Omnichannel will result in sales growth, not in a sales decline. How can you miss this simple fact? In order to understand how omnichannel will play out, we have to understand how profit impacts Executive decisions. In order to do this, we need to look at a retail market over time, and we need to understand what happens to a retail market when a store closes. Ok, let's evaluate a retail market ... let's pretend that you have two stores in Des Moines, Iowa. Let's compare the market in 1995, and then in 2015. Store #1 = $1,600,000 sales. Store #2 = $1,200,000 sales. SG&A = 25% of sales, or $700,000. Earnings Before Taxes = $280,000 ... 10% of net sales. Now, in 2015, marketing conditions changed, obviously. This market now generates 20% of sales via e-commerce. Retail comps are up about 10% over the past twenty years, but skewed to Store #1 ... Store #2 is in a retail location that is not as "upscale", so-to-speak. Store #1 = $2,080,000 sales. Store #2 = $1,000,000 sales. SG&A = 25% of sales, or $770,000. Earnings Before Taxes = $308,000 ... 10% of net sales. SG&A = 20% of sales (less than in retail), or $123,200. Earnings Before Taxes = $92,400. Total Market Sales = $3,696,000. Total Market Profit = $400,400 ... 10.8% of net sales. On the surface, it looks like everything is better. The market had a 32% sales gain over 20 years, profit dollars increased, and profit percentage increased. However, somebody in the Finance department is looking at individual store profitability. They don't like Store #2, and for good reason. That store generates $350,000 of gross margin dollars, but has an SG&A of $335,000. Store #2 is essentially at break-even. And if trends continue, this store will be unprofitable. So as the business becomes increasingly "omnichannel", the lowest performing stores are exposed as being unprofitable. These stores will be closed. It's been my experience that when a store closes in a multi-store retail market, between 60% and 70% of the sales at that store disappear. They're gone. In a single store market, between 70% and 85% of the sales at that store disappear. Store #1 = $2,080,000 + $1,000,000*0.15 = $2,230,000 sales. Store #2 = $0 sales (store is closed). SG&A = $450,000 (some of the expenses in Store 2 move to Store 1, not much). Earnings Before Taxes = $330,500 ... 14.8% of net sales. E-Commerce = $616,000 + $1,000,000*0.15 = $766,000 sales. SG&A = 20% of sales (less than in retail), or $153,200. Earnings Before Taxes = $114,900. Total Market Sales = $2,996,000. Total Market Profit = $445,400 ... 14.9% of net sales. Do you see what #omnichannel does to the Des Moines market? Omnichannel resulted in market growth from $2.8 million to $3.7 million. However, omnichannel rendered the weak store unprofitable. Once the unprofitable store is closed, sales drop from $3.7 million to $3.0 million. 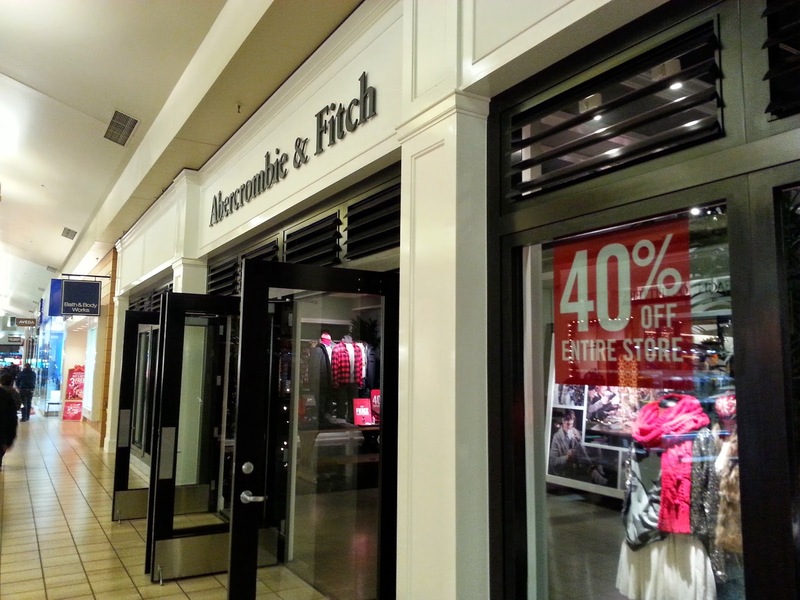 The store closure improves profitability from $400,400 (10.8% of sales) to $445,400 (14.9% of sales). On the surface, omnichannel will result (has resulted) in sales increases. Folks love this. But omnichannel exposes unprofitable store locations. 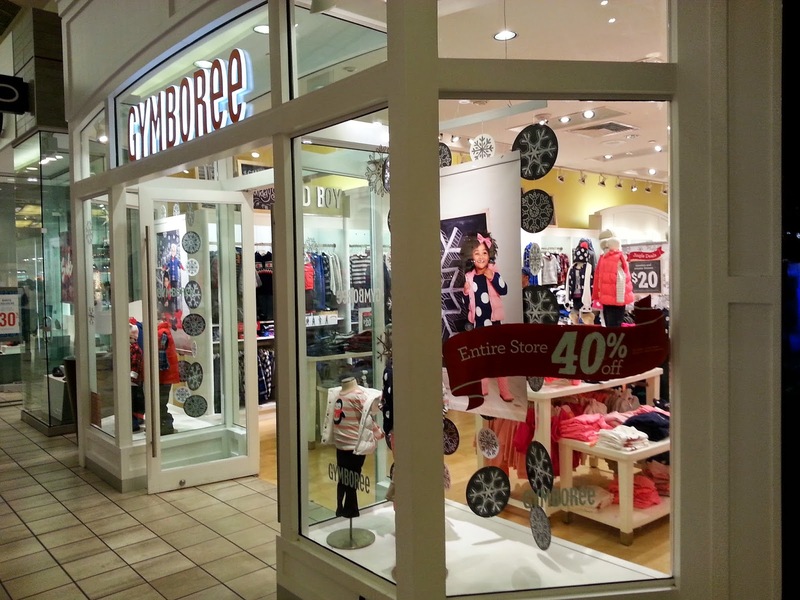 Sales are shifting from low-performing stores to high-performing stores. Sales are shifting from commodity items in stores to commodity items in e-commerce. When low-performing stores are rendered unprofitable by omnichannel, they will be closed. When these stores are closed, only a fraction of the sales are recouped. However, company profit will increase. Over time, omnichannel will expose low-performing stores, forcing them to close, causing an actual sales drop coupled with a profit improvement. What omnichannel is doing, then, is exposing the fraction of your retail sales that are truly generating break-even or worse performance. Omnichannel will then, ruthlessly, cause low-performing stores to close. At that time, e-commerce will not make up the difference, causing a sales decline and a profit increase. Omnichannel's logical outcome is the ruthless elimination of unproductive and underproductive and unprofitable retail sales. Give this article a read ... Walgreens is going to evaluate their store portfolio (click here). Omnichannel and Deep Digitization is going to crush existing stores. If a store is in the bottom thirty percent of the performance ladder, it's going to be evaluated, and ultimately, closed. Omnichannel is going to skewer fixed costs, folks. Measure this dynamic today, immediately - take any market where you closed a store, and look to see what happens to sales in that market. You'll quickly see that online does not make up the sales difference - doesn't even come remotely close. Retail sales don't meet expectations. Become more omnichannel - digitize everything. Digital is a variable cost structure - retail is a fixed cost business. Sales transfer from fixed cost in-store to variable cost online / mobile. Fixed cost retail underperforms even more. Lower 30% of store portfolio is axed. Retail sales partially transfer online, omnichannel does not grow the business, sales shrink. I've updated my presentation for the VT / NH Marketing Group "Who Is Looking Out For Your Interests" session on February 19 in Concord, NH. Click here for the updated slides, and let me know what I'm missing - let me know what you'd like for me to address. Here is a PDF for the day-long session ... as you can see, this power-packed event won't break the bank ... it's affordable, and you're not going to be sold anything by a vendor. Join Amy, Bill and I for a day of fertile discussion about the future of our industry. Click here for the PDF, then register and spend the day with us! Did I mention that there's no selling during the event? The slides are most assuredly worth a download - there's a brief view of the future, a whole section of tactics (mostly for catalogers - since catalogers responded that they want tactics), and a re-vamp of the history section, removing a lot of history. In honor of Boxing Day, I am turning my blog over to Roger Morgan, the Chief Operating Officer at Gliebers Dresses. Mr. Morgan would like the opportunity to chat a bit about the omnichannel movement that is sweeping the marketing landscape. My name is Roger Morgan. You probably already know that I am the Chief Operating Officer at Gliebers Dresses, most likely from the numerous thought leadership white papers I've written during my tenure at New Hampshire's 44th largest Catalog company. Mr. Hillstrom was kind enough to give me an opportunity to share my thoughts with you on the burgeoning movement known as "omnichannel". We've had a long and productive relationship with Mr. Hillstrom. Like many industry resources, we've paid Mr. Hillstrom a lot of money over the years, but never really got around to implementing his findings. I guess our circumstances are just fundamentally different than those experienced by other companies. You have to understand, our business model is unique, and the way we do things makes us different. You can't just plug a "strategy" into our business model and expect it to work. But omnichannel is different. You can plug omnichannel into a business like ours, and you can expect it to work. Simply put, according to a $1,795 thought leadership essay my company purchased from Woodside Research (a report commissioned by the Global Retail Federation, no less), omnichannel is defined as an "Everywhere Experience", or "EE". Omnichannel means that brands (like Gliebers Dresses) must provide a uniform experience everywhere, in order to meet consumer demand. I know Mr. Hillstrom is very tough on omnichannel. He is wrong. Is it wrong to only sell, say, online? Should you limit the number of marketing channels you utilize? Stop using retargeting? Stop using email marketing? Stop using affiliates? Stop using comparison shopping engines? Should a retailer ignore online channels and only sell in stores? And what about mobile? Should we all just ignore it because Mr. Hillstrom says your sales will simply cannibalize themselves? Ask Apple. It's better to cannibalize yourself than to be cannibalized by the marketplace. Mr. Hillstrom is wrong. No offense to him and his blog, of course, I'm grateful for this opportunity. But he is wrong. And I, through everything I've learned from Woodside Research and a handful of trade journalists, am likely to be right. Think about Barnes & Noble, for instance. Their "bricks 'n clicks" strategy allows the customer to browse a book while sipping a double tall mocha at the Starbucks store within a Barnes & Noble store. That's "bricks and bricks and clicks"!! Or, if the customer is so inclined, the customer can purchase the book digitally on a Nook device, and have the book delivered instantly. Why would a customer ever buy from Amazon once they're locked into a sound omnichannel bricks 'n clicks strategy like the one offered by Barnes & Noble? Am I right? Of course I am right. Heck, the customer could buy the book online, and then drive to a store and pick the book up. Or if the book was not available in the Manchester store, the customer could reserve the book in the Manchester store, drive to Nashua, and pick up the book in Nashua, and then drive home happy. Who doesn't like chasing from store to store to find a book, even though the competition could send a book instantly and groceries the same day? Having a seamless inventory system is critical to omnichannel success. And we know that omnichannel works, because everybody is doing it. Pioneers like Circuit City created the "buy online, pickup in store" model that is so critical to the development of the omnichannel thesis. Of course, capitalism is ruthless, so much in the same way that MySpace paved the way for Facebook, Circuit City paved the way for brands to, as I like to say, "reap the rewards" of a solid omnichannel foundation. First movers do not always experience the upside they generate for those who follow. We're at a point now where brands must follow the omnichannel thesis, or brands are dead. Yes, dead. There. I said it. I like to point to Coldwater Creek as an example of omnichannel strategy. See, Coldwater Creek was an early mover in the omnichannel frontier. They went public, they built stores, the shifted catalog marketing dollars into retail marketing. But that's not enough. Coldwater Creek failed to go "all-in". They needed to move all of their chips into the middle of the table. Had they done that, Coldwater Creek would still be here today, and Sand Point might well be the omnichannel commerce capital of Northern Idaho. See, the omnichannel thesis can't be wrong. Only brands lacking vision implement inferior omnichannel strategies. If a brand was willing to simply implement an omnichannel strategy, as outlined by research brands, consultants, trade journalists, and conference organizers, the brand would experience an outsized return on investment. It's guaranteed. But brands don't listen. Brands have siloed reporting relationships that limit their ability to execute as the experts tell them to execute. You cannot have siloed reporting relationships. The information technology team must work closely with marketing. Marketing must work closely with inventory management. Inventory management must work closely with creative. Creative must work closely with finance. In fact, all of these functional areas should be in the same silo, all executing the wishes of the Executive Vice President of Omnichannel Strategy, or in my case at Gliebers Dresses, the Chief Operations Officer. All departments, in fact, should report to this individual. In some ways, the CEO should report to this individual. It's just that important. Omnichannel turns the whole organizational structure upside down. Some days, I look at Mr. Glieber, and I tell him the following ... "Mr. Glieber, TEAR DOWN THAT SILO". Then I'll tell him that omnichannel strategy is a lot like free marketing. Mr. Glieber loves free marketing. But my company, like most others, is held back by Luddite thinking. We have a Marketing Executive who wants control over the integration of catalog and online marketing. She won't allow an Operations executive with considerable experience to even recommend an idea, much less an idea guaranteed to work. She'd rather sit in her silo and deal with her area of accountability. We have a Chief Financial Officer who counts beans all day - she's thoroughly unwilling to make the enormous and disproportionate financial commitment required to meet the omnichannel desires of the vendor community (and the customer). She's completely unwilling to borrow money to bet on a sure thing. We have a Chief Merchandising Officer who cannot understand that if we only sold in an infinite number of channels, our sales could potentially be infinite. It's simple logic, folks. We must look to Macy's, known only as "America's Omnichannel Store", as a shining beacon in an otherwise tepid bath of omnichannel failure. They are laying down the Oregon Trail of the 21st century. Ignore the naysayers who point out that Macy's posted negative comps in November. Omnichannel works. 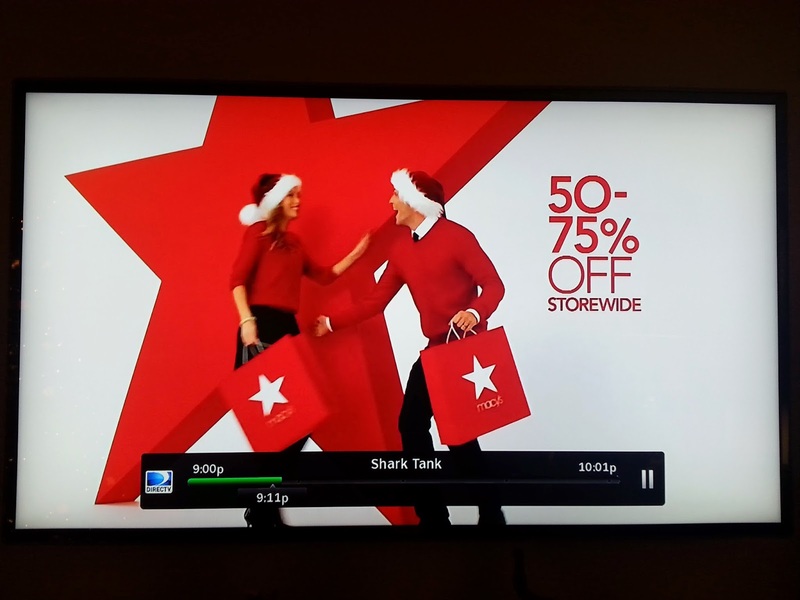 Without Omnichannel, Macy's might be posting -40% comps. Point a finger at their merchandising team, and demand that the merchandising team pick up their game, if you want to blame somebody for negative comp store sales in November. Mobile is the next biggest frontier in the Omnichannel forest. Remember, almost all brands failed to implement social media properly. Some people, including the host of this blog, suggest that if you are not marketing to a customer under the age of 30, you will not generate more than 1% of your sales from social media. That's just wrong. It's lizard logic. The reality is that almost all brands fail miserably to capitalize on the pot of gold known as social media. Brands are wrong, the omnichannel thesis is right. But I digress. Brands need to be first-movers in the mobile sphere, or risk tasting the rusty obsolescence that brands like Coldwater Creek choked on. I don't care if your customer is 87 years old and is looking to purchase a walker, that customer is looking to purchase a walker on a five inch screen while using 4G connections at 20mbps. And then the 87 year old is checking in on Foresquare after following GPS directions on his smart phone. That's how "the customer" behaves. Mobile is the next frontier, and an appropriate omnichannel strategy includes a strong social media presence fueled by real-time mobile customer interaction and an expanded use of Big Data. More on that subject another time. Does Gliebers Dresses deliver on the omnichannel promise? Absolutely not. We have too many old-school thought deniers to make the progress we need to make. If we do not make progress, we, too, will be out of business. I'd hate to be my co-workers on the Executive Team I am part of - they won't be able to get another job if we go out of business. I, however, will be just fine, having been on the forefront of the omnichannel movement. Readers, I am literally begging you to get on the omnichannel bandwagon. Won't you join me on this thrilling ride through the landscape of the omnichannel movement? This question came to us from an individual on Twitter. Question: You are very hard on social media, and you are wrong. Retail is being reinvented, right before our eyes. All you have to do is look. Look at Brandy Melville, for instance. Why do you think social media doesn't work? This whole issue is just such a time waster. It can be twisted to fit the narrative of any individual. But the person asking the question on Twitter is technically correct, in some instances..
Click here, and click here, to read more about Brandy Melville (click here to see the home page). The individual on Twitter forwarded the information to me. Let me tell you a story. Four years ago, I was speaking at a conference in Berlin. I was having dinner with the CEO of a small, fashion company ... under $10,000,000 in annual sales. The CEO told me how his team scraped information from the internet in the morning, discussed trends around lunch, and put together an assortment in the afternoon. Two weeks later, the merchandise conceived today was available for sale on his website. The entire process was based on data - what were people talking about, what images were being shared, what colors and moods were resonating? Analytics folks love this ... they call it "being data driven". Today, some folks call his methodology "fast fashion". Let me tell you another story. I recently visited a company. This company was operating nine months out. In other words, they were planning their summer 2015 assortment. There wasn't data available, nor did the merchandising team want data. They were making guesses as to what they wanted to accomplish. One person called this technique "leading the customer". Do you understand the difference in approach between the two companies? Both can work, of course. But there is a major difference. The first company is not proof that social media works. That's not the issue. The issue, of course, is that social media simply "is". It's no different than the focus groups and surveys of twenty years ago. It's both marketing and customer research. It's data. It just "is". You cannot separate social media from the rest of the branding elements of the business. You can't. You cannot prove that social media works, and you cannot remove it from the business. It is not a tactic. It simply "is" the business. And customers are acquired cheaply as a result. The second company can easily prove that social media doesn't work. They should know. They tried putting some sale messages on Twitter, and nobody responded. The second company is fully confident in their merchandising team. The second company just needs to find marketing channels to communicate the merchandising strategy to the customer. The second company is going "omnichannel". They'll ship-to-store or buy-online-pickup-in-store or get you a discount on your mobile phone when you're in the mall (if the customer ever steps foot in a mall anymore). Retail is moving in two different directions. The first direction is a deep understanding of the target customer, based on scraping as much data as humanly possible from the internet. Merchants use information, say images from Instagram, to understand how the target customer feels today, and then merchandises against what s/he sees. It's a modern blend of art and science. It's terribly hard for old-school marketers to understand how to run a business this way - neurons in the brain have been hard wired, it's too late now to change (but it is not too late to trust somebody else). The second direction is a deep immersion in digital tactics, enabling an infinite number of channels to sell merchandise. The belief is that the merchandise and marketing strategies are sound, it's just that the customer "demands" multiple channels to complete a transaction. This direction is good for the vendor community. This direction is good for old-school CRM folks. This direction is good for traditional merchants looking to "set the trends" in a traditional manner. Most traditional retailers are choosing the second direction, and for good reason - it's easy to understand. Younger customers are choosing the first direction. During the next twenty years, it is possible that the first direction will run the second direction out of business. Or maybe the first direction will lead us into an unholy nether world that nobody likes - that can happen when we optimize for the short-term. Here's a question I received a few months ago from a person about thirty years old. Question: Why, Kevin, are Executives so unwilling to listen to young people? I recently had an Executive Vice President suggest that I put in a multi-decade apprenticeship, and then, and only then, would I be qualified to earn some amount of accountability for the business. I look at what Executives are doing, and they are going to doom their businesses by not focusing on the future customer. They only care about the current customer, and they want to communicate with the current customer using techniques from the 1990s. I don't understand it. Can you explain it to me? Variants of this question come up on Twitter every day - where maybe half of my audience is under the age of 35. There's a level of contempt that I recall having at that age, but the contempt is different, because technology enabled a generational skills rift. I participated in a meeting. The EVP of Marketing was talking about catalogs ... would 124 pages be appropriate or 128? I looked across the room, and there was an employee, maybe 25 years old, bored out of his mind. I mean bored. After a lengthy discussion about the branding benefits of four additional pages ("the four pages make a bold statement about our belief in this new product line"), I jumped in, and asked the 25 year old employee what he'd do to market the products that would be featured in the four additional pages in the catalog? The 25 year old employee sat up, at attention, and gave a detailed outline of how he would record videos of customers using the products, and would create a sub-section of the website that had videos and customer commentary about how customers (not copywriters) use the products in the real world. The EVP looked across the table, and said "We're not gonna do that." The 25 year old responded ... "Why? It wouldn't cost us anything to do it." The EVP was getting upset. He leaned across the table ... "We'd have to hire an agency, and have professionals film the scenes. It would be very expensive. We're not a cable network." The 25 year old sat back in his chair ... "I'd film it on my iPhone as a proof-of-concept. Give me a landing page and let me see if I can get customers to engage with my content." The EVP, face wrinkled with stress, said ... "My customers won't appreciate a video taken with a smartphone. My customers expect more from us." The 25 year old put his pen down, and said ... "Customers my age aren't going to thumb through a catalog. They want to know how somebody actually uses the product." I've been there - I once had an employee who wanted to send chocolates to customers to put on their pillow. I did not respond favorably, and in the process, I'm confident I subsequently shut down many good ideas, because younger employees didn't feel comfortable sharing them. Make a New Year's Resolution ... give young employees a fraction of your business, and let them run with it. See what they would do, and see if their ideas work. Pretend you were the old Coldwater Creek, RIP. They could have given a line of dresses to a young marketer ... the buying team might forecast $30,000 in sales online ... see if the young marketer can grow sales for this product line ... and if the young marketer was successful in growing sales, pay close attention to what the individual did. Could anybody else learn from the individual? This question came from an industry consultant. Question: Your criticism of omnichannel strategy is naive and misplaced. Omnichannel is the future. You have to do it just to maintain sales. If you don't do it, your sales will decline, there's no question about that. So for you to sit there and criticize a movement is nothing short of irresponsible. You're only hurting our clients. Our clients need to move forward, right now, or be left behind. And to be honest, they're being left behind. It's hard to predict the future. When Don Libey called retail malls "... those Cities of the Dead" back in 2006, folks laughed it off, because comps had been increasing for three consecutive years. It took 1-3 years before The Great Recession gutted businesses ... and it took 8 years before a strategy of "bricks and clicks" trained customers to only click and to stop visiting the bricks. Fifteen years ago, nobody could have envisioned that a hundred thousand future messages demanding that customers click instead of drive to a store would result in a customer being conditioned to click and not drive to a store. But that's where we are in 2014. Mall traffic is in serious decline, down by more than 50% in just five years according to some estimates ... down 10% or more vs. just last year according to other estimates. The story turned out opposite of what we thought. Opposite. We thought that we could mix all tactics together and grow sales. Instead, we trained the customer to click. For me, these questions are frustrating, because the individual asking the question is making an assumption ... the assumption is that by becoming more "digital", the customer will click more, and we'll magically turn those clicks into in-store visits. We assume that the customer at Alderwood Mall will click on a phone and then visit Macy's. There's a small problem with the assumption ... how in the heck are we going to get the customer to drive to Alderwood Mall to get the customer to click through a message on a smart phone while in the mall to visit Macy's in the first place? Omnichannel, or as I might call it "Deep Digitization" is just as likely to encourage customers to click and click and not act as it is to cause a customer to visit a store. If the former keeps happening, deep digitization will bankrupt us, because there won't be enough retail business to cover the debt most retailers have piled upon the balance sheet. We don't know how the future will turn out. No one does - especially those who advocate that you must be omnichannel. No doubt, your mobile device will interact with physical stores, that's already happening. What can be argued, however, is whether deep digitization can cause a customer to leave home, get in a car, and drive to a store. There is increasing evidence (in my retail projects, by analyzing actual customer data, not analyzing survey data) that deep digitization causes customers to increasingly not interact with physical stores, and that's a serious problem that nobody seems to want to address. Ask the experts what, specifically, the appropriate tactic is that will cause a customer to ignore fifteen years of digital messaging telling the customer to stay away from the store to then shift behavior and instead drive to the store? That's the test, folks. Buy online, pickup in store is not a strong enough answer, or Circuit City would still be in business. This is a question I fielded on Twitter. Question: Isn't the future all about mobile? And if the future is about mobile, then shouldn't catalogers and retailers immediately pivot, focusing on the future, prioritizing what is important over what mattered in the past? Averages are greatly distorting the importance of mobile. Look at this chart from Business Insider (click here please). More than 50% of the content consumed by those age 16-24 come from mobile devices. Maybe 30% of the content consumed by those age 45-54 come from mobile devices. Less than 5% of the content consumed by those age 65-74 come from mobile devices. Well, mobile is a reflection of your core customer. If you have no mobile presence, maybe it is because you have no customers under the age of 40? In fact, that's probably the reason you don't have a mobile presence. Mobile is directly correlated with demographics / generational shifts. So if you get 9% of your traffic from a mobile device, and you mail catalogs, you cannot possibly be "mobile first". You'll bankrupt yourself in the short-term. And in the long-term (probably 15 years), without a viable strategy for younger customers, you'll bankrupt yourself. So that's fun to think about. And if you get 59% of your traffic from mobile devices, you have a completely different challenge ... the future is going to change, it's moving right under your feet ... and is risky. You are "mobile first", but mobile is in the top of the first inning. If you are a retail brand with a customer base > age 45, well, being "mobile first" is a sure way to harm sales even further. Your customer doesn't view mobile as the number one component of a content strategy. Neither should you. This is why I continually preach a merchandise gospel to most businesses - the demographics simply demand priority of merchandise over channels, especially among customers age 55 and up. This question came to me from a trade journalist. Question: Don't you think that most retailers simply fail to have a coherent strategy? In other words, retailers are struggling because they are not strategically thinking about their omnichannel future. Why aren't retailers rapidly adopting omnichannel tactics? Isn't this the only way that retailers will survive? Where is real strategy? When folks talk about "retailers", they're usually talking about billion dollar businesses. Those businesses possess anywhere between 5,000 employees and 200,000 employees ... or 1% of the workforce in the case of Wal-Mart. These are big businesses. Hundreds of Vice Presidents, several hundred Directors, thousands of Managers. Every single person with their own version of the future. Every single person wanting to implement their own strategy. Every single person believing that their way is best. When I hear criticism of large companies (I worked for Lands' End, Eddie Bauer, and Nordstrom ... those are big companies), I frequently hear the complaints from individuals who work at small companies. A trade journalist doesn't work at a company with 1,000 employees, in most cases. The trade journalist might need to please six individuals, whereas the Retail Executive may have to please six thousand individuals. It's easier to have a strategy when you have to bring six people along with you. It's hard to implement a strategy when you have to bring six thousand salaried individuals with you. Let me give you an example. When I worked at Nordstrom, my team determined which version of ten email campaigns a customer would receive. My team owned this tactic. And then, one day, I get a call from a customer - the customer wants to know why she was mailed a campaign from an employee working in a store? Well, I'm accountable for who receives email campaigns, so I feel pretty confident that nobody in the stores are sending their own email campaigns. Not only was I wrong - not only were hundreds, maybe thousands of employees sending their own campaigns, but one of my coworkers, a technology Executive, was facilitating many of these campaigns. This person was helping send the campaigns on behalf of the employees in the store. This went against our "multichannel email strategy". Well, it was my job to clean this up. Did I clean it up? Heck no! Half of the Executives I worked with thought this was a catastrophe, and demanded that I stop the practice immediately. Half of the Executives I worked with thought this was brilliant, thought it encapsulated the Nordstrom entrepreneurial spirit. Not only did they not want the program stopped - they wanted to expand the program. The technology Executive helped me create a process to allow store employees to send their own campaigns. I'm sure a minority of employees used it. It was not possible, not possible to align 50,000 employees along something as simple as email marketing rules. Retailers have strategy, trust me. Retailers have too much strategy. There are enough strategy decks (Powerpoint) at retail businesses to "fill the cloud". I work with retailers that are highly strategic, and implement strategy in a highly successful manner. I work with retailers that are highly strategic, but are unable to implement strategy due to employee disagreements (this would have been my Eddie Bauer experience, back in the 1990s). I work with retailers that are highly strategic, fight the wars to get the strategy pushed through, and then fail miserably when the strategies don't work. Most outsiders love beating these companies up, don't they? I work with retailers that are not strategic, but are so tactically superior that they enjoy high levels of profitability (this is what I would have considered Nordstrom to be, back in 2007 when I left, and this is what I considered Lands' End to be, when I worked there in the 1990s). I work with retailers that are not strategic, and are tactically inferior. This isn't good. But most of the time, there is a strategy. How that strategy is translated to those on the outside is unclear, and results in outsiders beating big retailers up. Here's a question I received earlier this year. Question: My company performed a Merchandise Forensics evaluation of our business. We learned that customer productivity is not improving. Our CEO fired many members of our merchandising team as a result. Is it really the fault of the merchandising team when the business struggles, or is the marketing team failing to do their job? In other words, shouldn't the marketing team find customers who want to buy the merchandise we offer, at the price we offer it at? In 83% of the Merchandise Forensics projects I've conducted, there are serious flaws in merchandising strategy. Expansion of unproductive categories. Failure to launch enough new products. Discontinuation of winning items. Serious discounting resulting in a reduction in gross margin dollars. All of these things impact customer productivity. When the merchandising division negatively impacts customer productivity, changes need to happen. I'm not saying folks deserve to be fired. I am just saying that changes need to happen. The marketing / merchandising challenge is real, and it is spectacular. In the past two years, there have been two trends that frustrate me. A growing lack of merchandising discipline. Marketers seeking to impress outside audiences instead of co-workers. The latter is frustrating because it is the job of the marketer to sell merchandise, not to impress researchers, trade journalists, vendors, and consultants with mobile strategies and omnichannel tactics. The former is frustrating because the metrics are there to show that we're making myriad merchandising mistakes, but we instead choose to trust our own instincts. In 2015, we need marketers and merchandisers, working hand-in-hand, improving customer productivity. Neither side is right, neither side is wrong. We simply need both acting in a collaborative, disciplined manner, working for each other. We're going to go through my mailbag for the rest of 2014 - your questions shape what we need to focus on in 2015. This question was asked of me in January, from a Catalog Executive. Question: We conducted extensive holdout testing, and learned that we are overstating catalog performance by 100% - in other words, 50% of the demand attributed to a catalog happens anyway when we stop mailing catalogs. If we obey this outcome, then a series of terrible outcomes happen. We will cut housefile circulation by between 40% and 45%, shrinking the customer file by between 5% and 10%. We will likely eliminate 15 of the 27 in-home dates we have, because these in-home dates don't generate enough incremental volume to justify being on the mail calendar. When we eliminate 60% of our catalogs, we have to eliminate many, many jobs. I don't want to eliminate many, many jobs. That's too painful to go through. Therefore, I don't want to adhere to what the test results suggest. It would kill my business. Tell me that I'm doing the right thing, Kevin. There isn't a right or wrong answer to the arguments above, is there? We get to pick the business we want to manage. If we want to manage a $60,000,000 business that generates $2,400,000 of pre-tax profit by mailing a lot of customers a lot of catalogs, and we keep people employed in the process, then that's the choice we make. To get to 10% pre-tax profit, however, we're going to need a monumental improvement in merchandise productivity. And that's not going to happen. Even if it happens, given current practices, you'd mail even more, causing you to never achieve 10% pre-tax profit. Geez. If we want to manage a $50,000,000 business that generates $5,000,000 pre-tax profit by drastically reducing mailing volume, and many employees lose their job as a consequence, then we can make that choice, too. Painful. But if ownership demands $5,000,000 pre-tax profit, then this is how we get there. Or we can pick something in-between. In 2015, we need to make choices. We've been doing the same thing, year-after-year, expecting better results. Better results do not seem to be part of the 2015 forecast, are they? It's time to choose the path we want to take. And if we want to choose the $60,000,000 / $2,400,000 solution, then let's just publicly acknowledge what we're doing and move on, and realize that the minute merchandise productivity takes a 5% hit, we're losing money and we're letting people go and we're doing the things we'd be doing by achieving 10% pre-tax profit, just for a different reason. You probably read this article in Vox ... about Abercrombie, Delia's, and Aeropostale (click here). Do you read Vox? Or Mic? These are not traditional news organizations. They are enjoyed by younger readers - whereas Fox News and MSNBC are enjoyed by older Baby Boomers. And you can click here to read about traditional news organizations being cut off from civilization ... 2/3 of readers being age 55+. Why bring up the news angle while discussing retail? Because demographic changes are obliterating existing businesses, cutting existing businesses off from younger customers. Catalogers went through this transition first, and catalogers have finished the transition. When you analyze the vast majority of pure catalog businesses, you find a customer base that is 50-90 years old, with an average typically in the low-mid 60s. Customers under age 45 are cut off from catalogers. The transition is over, and is highly unlikely to be reversed. The content / merchandise / channels used by catalogers appeal only to those age 50-90, further cutting off younger shoppers. When the transition was in-process, experts told catalogers to be "multi-channel" ... to simply move into all channels to acquire all customers. The strategy failed. Because the merchandise and content only appealed to older customers, younger customers simply abandoned catalogers. The outcome has been decided, save for a minority of companies (there are no laws, there are probabilities). Multichannel did not work for most. Retailers, on all levels, are now going through the same process. An Abercrombie / Delia's / Aeropostale catered to a pre-mobile customer, and are now lost as Gen-X kids exhibit fundamentally different behaviors. 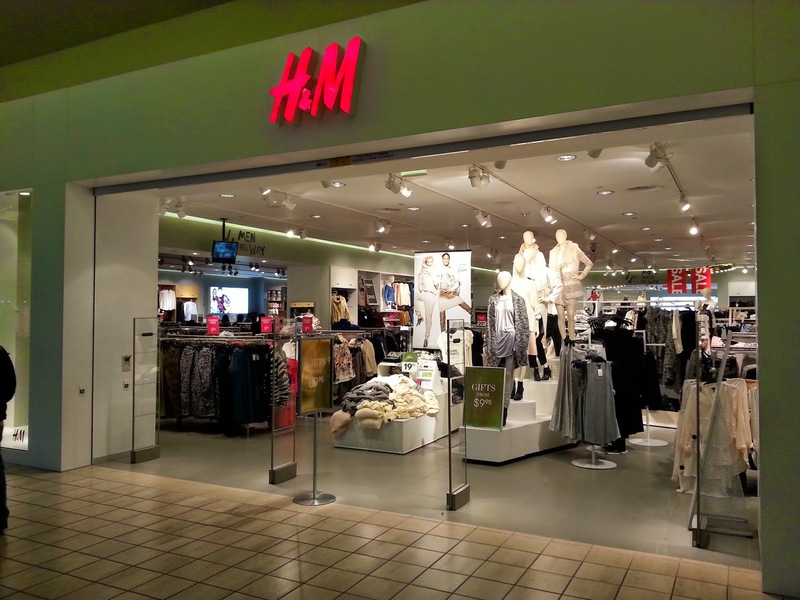 And it doesn't matter how "mobile" these businesses become - the core issue is competition with H&M and "fast fashion" - customers moved there, and the younger segment is cut-off from Abercrombie / Delia's / Aeropostale. Now, in fashion-centric businesses, merchandise plays a greater role, it has a short half-life, so problems can be fixed. But the problems are more merchandise-centric in nature, they aren't "omnichannel". Be honest - the 17 year old H&M shopper isn't looking for a "buy online, pickup in store" solution. Be honest! Then there's the rest of retail. Notice that high-end fashion-centric businesses are not struggling, but the "middle" is being absolutely gutted. High-end fashion depends upon a small number of highly affluent shoppers, often older shoppers. Behaviors aren't changing as much there. But the rest of retail, lower/middle income, is being gutted. Gutted by audience and price. Gutted by ten years of retailers teaching customers to sit at home and not visit a store. Spending less on apparel compared to other categories. Attention turned to mobile devices. If we remove the "teen" focus of the article, the 3rd/4th points become highly relevant, don't they? We trained the customer to sit home and click - every expert in the retail industry told us this would be a good thing (multichannel / omnichannel). The exact opposite happened - it's a bad thing - customers click and don't get in a car and drive to a store. So malls are dying as a consequence ... many studies suggest that mall traffic is down by anywhere between 10% and 50%. Nobody is going to the mall. Think about your spending habits - you have home internet, you have mobile devices and mobile internet ... you didn't have these two issues 20 years ago. Your dollars now flow in that direction, and away from malls. We're being told that the solution is to just be "omnichannel" ... be everywhere ... digitize the entire business ... and problems will be solved. The real issue, of course, is this ... how in the heck are we going to train the customer to get in a car and drive to a store? Panera Bread and Chipotle figured out how to get a customer to get in a car and drive to their stores - while McDonalds failed. The secret, then, isn't omnichannel. It's a marketing / merchandising strategy that causes a customer to get in a car and drive to a store. Too few of us are focusing on the strategy. Retail can be fixed - even though there are way, way, way too many square feet available. Courses can be reversed. Time to get busy. When you run diagnostics (click here for the booklet) on an emerging mobile business, you usually observe one of two outcomes. The first outcome is most common ... customers are simply shifting from old-school channels to newer channels, with no incremental increase in business. The second outcome is illustrated here ... not as common, but an outcome we all wish would happen more often. As you can see, total comp segment demand is increasing, annually. That's good! Now, old-school channels are declining, so channel shift is still happening. However, mobile is providing incremental value. 2012 = ($80 - $77) / ($5 + $1 - $2 - $0) = 3/4 = 75% of mobile demand is incremental. 2013 = ($84 - $80) / ($10 + $3 - $5 - $1) = 4/7 = 57% of mobile demand is incremental. 2014 = ($86 - $84) / ($8 + $9 - $10 - $3) = 2/4 = 50% of mobile demand is incremental. This is a wildly favorable outcome. The analysis tells us that mobile is, on average, 60% incremental. 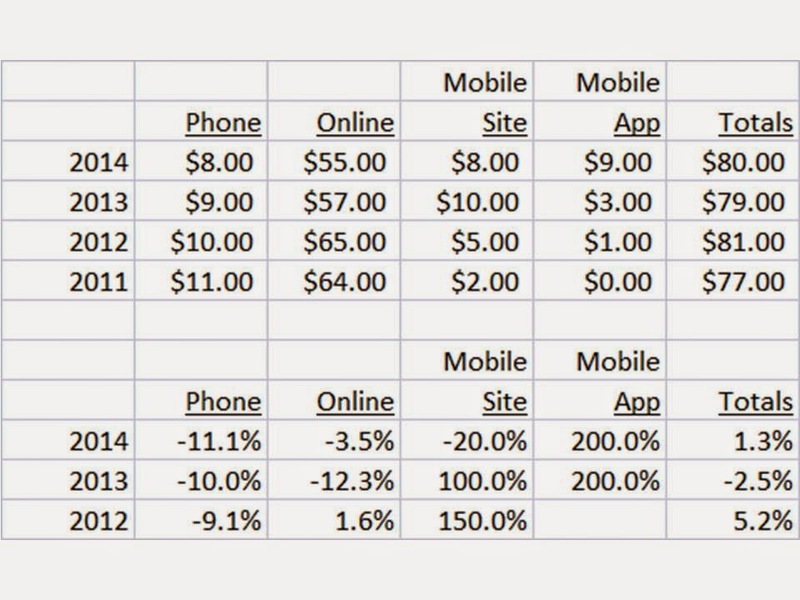 For every $10 generated by mobile, $6 would never happen otherwise, $4 is shifting from other channels. Run this analysis! If you obtain this outcome, you've made magic happen! In Hillstrom's Diagnostics (click here for your copy), I talk about using a comp segment analysis to measure changes in customer behavior. In this case, I am using annual comps to understand how customers with exactly two purchases in the past year behave in the next twelve months. The top portion of the table illustrates the comp dollar values, the bottom portion of the table illustrates comp percentages. Demand through the call center is in decline, as has been the case for nearly twenty years. But look at online demand (desktop / laptop). After peaking in 2012, demand is in decline. Mobile site (tablet + phone) peaked in 2013, and now that, too, is in decline. This company has a mobile app ... as you can see, demand is rapidly accelerating within this marketing channel. What do you observe, in total? For the past three years, productivity is flat. If this is what you observe, then your customers are simply shifting channels. Mobile does not truly add value (from a profit and loss standpoint), though it serves the purpose of facilitating changing customer behavior, and that's important. But you cannot, in this case, come to the conclusion that mobile is causing an increase in customer spend. You can simply conclude that mobile facilitates channel shift. Nonetheless, this analysis should raise numerous strategic questions. Mobile accounted for 3% of customer demand three years ago, then 7% of customer demand two years ago, then 16% of customer demand one year ago, and 21% of customer demand today. In five years, what share of demand will be captured by mobile? 35%? 50%? 65%? What does it mean to the business if any of the three outcomes happens? What is the future of the traditional desktop / laptop website? What is the demographic / psychographic difference between the emerging mobile buyer, and the old-school desktop / laptop buyer? What are the merchandising preferences of the desktop / laptop buyer, and the mobile buyer? Run the analysis, if your customer is under the age of 45. What did you learn? She wanted to buy an item. She visited the store. Item was available. She takes item to cash register. Sales Associate says "Double points begins tomorrow ... do you want to delay your purchase by a day to earn double points?" Sales Associate says "If you are willing to receive the item at home, I'll ring it up for you tomorrow, and deliver it to you next-day. You'll get double-points and have the item in 36 hours." Do you understand what just happened here? The omnichannel solution, being celebrated by raised glasses of champagne among omnichannel advocates, resulted in three key outcomes. The customer got the item 36 hours later instead of immediately. The customer earned double points, which means the customer will pay less for merchandise in the future, lowering company profit in the future. The company generated less profit because it had to spend $5 +/- to next-day the item to the customer. I'm not sure how we, as an industry, got to this point in our evolution. This is what happens when trade journalists, researchers, vendors, and consultants are influencing those driving the bus. Does anybody measure profit anymore? Or am I missing something? If I'm missing something strategic that results in greatly increased profit, please let me know. I realize this article is more than six months old - but you're sitting at work, waiting for your omnichannel integration meeting ("all hands on deck, all channels matter"), so give it a quick read (click here). Most important? The average age of the person watching cable news is usually > 60 years old, and is, in the case of Fox News, frequently older than 70 years old. Think about the demographic disconnect between the cable news audience and the general population. You're not likely to get the average view to tweet a lot, are you? And how likely is this 70 year old person to pull out the iPhone and engage with mobile information? You end up with a nasty problem, don't you? If you abandon your core audience, you don't have an audience, and your business suffers greatly. If you stay with your core audience, nothing "new" works, and your business is destined to fail in the future. You cannot do any of the new stuff, because it won't resonate with younger folks, and it will be ignored by the core audience. What would you do if you were Fox News? Discuss the strategies you'd employ to protect the long-term future of your business. Or do you even care? These issues map perfectly to catalog marketing, as we all know. And these issues are going to eat up the customer base at traditional retail businesses. Demographics, Channels, and Merchandise all interact with each other. And when your business gets pinned into a demographic corner, it is terribly, terribly hard to get out. All Sorts Of Retail Trouble - What Is Your Solution? 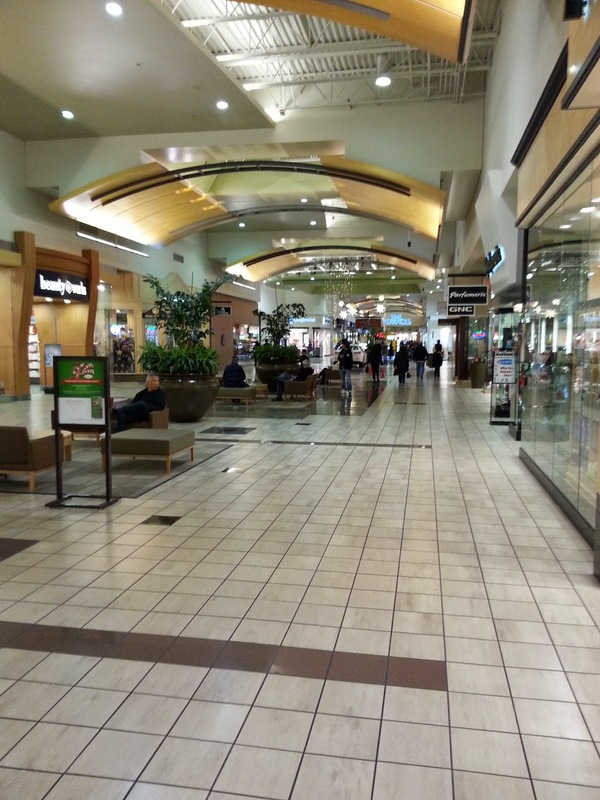 On Thursday, I visited Alderwood Mall, north of Seattle. "Up to 70% off the Entire Store" would have been shocking just two years ago ... had it been offered the week/month after Christmas. We've come to expect deep discounts right after Christmas. As you can see, the mall wasn't exactly stuffed full with shoppers carrying branded credit cards capable of earning quadruple points. Those who were in the mall were treated to a veritable plethora of assorted discounts and promotions. Here's something for you to consider ... if your business is healthy, you do not sell everything in the store at 50% to 75% off on the first weekend of December. This only happens during a retail meltdown. And remember, many of you love Macy's, many of you love their omnichannel strategy. If the omnichannel strategy was so effective, as most of you suggest, then why take 50% to 75% off? Do you take 50% to 75% off when your business is succeeding? Ask Apple. And what about gas prices? You're paying a $1 a gallon less for gas. Retail sales are horrible, and customers have more money to spend than last year. Where are those dollars going? Think this mall is suffering? Well, it depends where you shop. 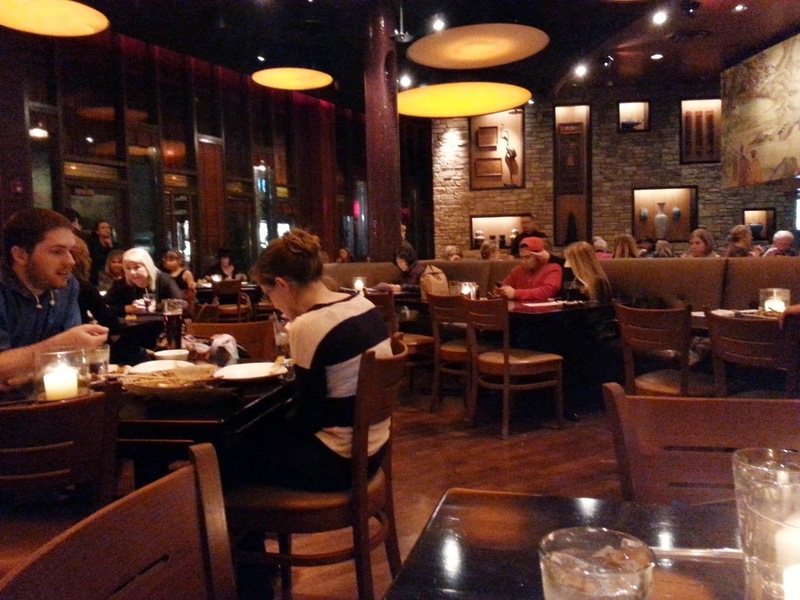 Here's the view from my table at P.F. Chang's ... and guess what? No discounting. You don't need to discount when the place is nearly full. Lots and lots of profit to be had. And they were turning tables at a blistering pace. Meanwhile, back in retail, inventory is not turning, though some stores were not completely desperate ... this store had a sale banner way in the back (and by the way, this brand grew to billions in US retail sales without so much as an e-commerce website until mid-2013 ... supporting a branding/merchandising thesis as the secret to success). We told the customer for a decade, for a decade, to not drive to a store, but to instead sit at home and click. The customer listened. Click click click click while sitting in a chair. Hundreds of thousands of messages, folks. We needed to tell the customer to get in the car and drive to the store. This is the outcome of letting the digital folks control the message. Today, we tell the customer to click on multiple devices. The customer listened. More clicking, less action. We broke pricing integrity during The Great Recession, and have accelerated the catastrophe ever since. Market share now trumps profit (and cash). We taught the customer to not purchase in October/November - through hundreds of thousands of messages, we taught the customer to wait until Black Friday / Cyber Monday. Then, we broke the "big weekend" promise, by offering great deals after Cyber Monday, thereby destroying whatever integrity existed in a fake holiday created by a trade organization that seems to be doing their best to bankrupt their members. For the customers who were trained to sit at home, we further accelerated our demise by promising to ship merchandise on orders right up until a few days before Christmas. From a customer service standpoint, this is fantastic. From a customer behavioral standpoint, this is a catastrophe. In other words, we trained the customer to sit at home and wait for the best deal - even if it comes on December 20. The customer trusts that merchandise will arrive in a few days, and holds $$ until December 20. The money that used to go to retail stores now goes to Verizon, Apple, Samsung, and Comcast. We respond by offering bigger discounts earlier ... November 1 in many cases in 2014 ... in an effort to "lure" the customer back into a store before Black Friday. This trains the customer to wait even longer, thinking that bigger discounts will be coming on Black Friday / Cyber Monday (and they did), thereby destroying gross margins in early November, margins that would have been harvested at full price in prior years. By mis-managing inventory levels, we had to more heavily clear merchandise in the December 26 - January 15 timeframe (through 2013). This created even bigger discounts after Christmas. We pushed gift cards upon the customer. Good idea from a customer service standpoint. A catastrophic idea from a customer behavior standpoint. Now, the customer buys a gift card on December 20 ... gives it to a customer on December 25 ... and that customer uses the gift card to purchase merchandise at deep clearance-centric discounts. We pushed profitable demand out of pre-Christmas into liquidation demand post-Christmas. By focusing the business so heavily on December, we moved demand out of all other months, into December. What used to be highly profitable demand all year becomes margin-less demand in December, hurting the profit and loss statement. As we all know, December customers typically have lower lifetime value than everybody else. So, we transitioned our customer base into December activity that assures lower future value, assuring bigger discounts the following year when customers do not shop at the rates we anticipated, accelerating the discounting problem even more. This never-ending cycle will manifest itself via the closing of the bottom third of the retail portfolio. Profit is being crushed, and when that happens, the weakest stores will become so unprofitable that they will be closed. Worse, we've trained the customer to never enter a store. We trained the customer to sit at home and click right up to December 20 (unless we demand that the customer shop via a discount after abandoning a shopping cart - that happen online, not helpful to in-store traffic). Those who did act in-store were treated to between 25% and 70% off. Why would these customers ever pay full price again? That's what the data tells me. I get to analyze a lot of data. Not survey data of 3,398 likely shoppers who are "confident" that they would spend more with omnichannel business models, but data from billions of purchase transactions from real customers at real companies. I have proof that we've done this to ourselves ... a hundred best practices all interacting with each other, yielding bad practices now labeled "omnichannel". Maybe you disagree with me. If you disagree, send me an email (kevinh@minethatdata.com) or leave a comment. Offer your hypothesis. Show all of us the data that gives your hypothesis credibility. Offer your solution (my solution is pricing integrity, fair inventory buys, great merchandise, and great service, retraining a customer to get into a vehicle and visit a store ... I know ... terribly boring). I will publish the best responses. Here's your chance to offer folks a path out of the woods. Leave a comment / send an email message to me. How would you fix the spiral we're in?